Hi, I am interested in your 1960 Chevrolet Other Chevrolet Models (stock #MBOT6699) listed on Autotrader for $24,995. I'd like to get more information about this vehicle and confirm its availability. 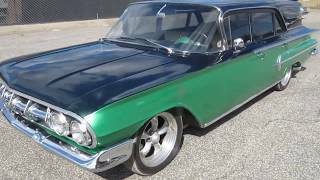 Super straight and clean cruiser in this 1960 Chevy Brookwood (IMPALA) 2 Door Wagon (same as a Nomad). Equipped with freshly rebuilt 355ci V8 with HOLLEY Fuel Injection System, added VINTAGE AIR CONDITIONING, digital gauges and TONS MORE! The car has been collector owned in Florida for the last few years. Body is very nice and straight and super tight throughout. Excellent gaps overall. Doors open and close perfectly! Paint shines up BEAUTIFULLY as you can see in pictures. Looks to have all original panels. Has been taken to the Good Guys Rod Tour and the Power Tour in the past. Interior has been completely redone, rather tastefully throughout with two-tone colors VERY COMFORTABLE AND BEAUTIFULLY DONE (seat covers, carpeting, door panels, armrests, headliner, etc). Dash upgraded with DAKOTA digital gauges all wired perfectly. Mechanically it runs/drives BRAND NEW! Car starts right up, runs beautifully and drives nice and straight with nice shifting transmission and excellent brakes.